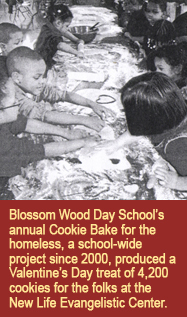 Blossom Wood Day School’s annual Cookie Bake for the homeless, a school-wide project since 20000, produced a Valentine’s Day treat of some 4.200 cookies for the folks at the New Life Evangelistic Center. Blossom Wood is a private, independent, African-American-owned school located in suburban North County. Congressman Wm. 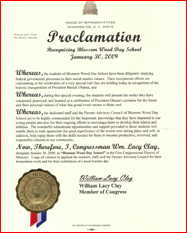 Lacy Clay recently helped Blossom Wood celebrate at the 2009 Inaugural Ball. 4-H in St. Louis is offering Robotics programming. Call regarding forming a club or adding to your school's curriculum. In this video, we watch Blossom Wood Day School's Robotics class, which they have added to their school curriculum. Contact us - MU Extension St. Louis 314-400-2115. 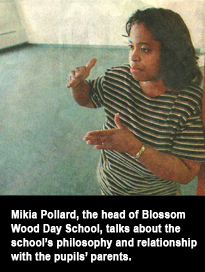 In 1998, Mikia Pollard started teaching 11 kindergartners in her condo in North county. This fall, Pollard’s Blossom Wood Day School opens with 75 children in a school building in Hazelwood. When Mikia Pollard quit her job as an early childhood specialist in 1998,her plan was to have children and become a stay-at-home mom. Pollard also decided that she would home-school her children – once she had them. To get ready for that commitment, she decided to try teaching a group of 11kindergartners that year in her condominium in Florissant. She told herself it was just for practice. But this weekend, Pollard was coordinating the placement of boxes, desks and computers at the new site of her Blossom Wood Day in Hazelwood. That’s the school that she started in her condo in 1998. “This was just not suppose to happen,” said Pollard, 34. All Pollard wanted to do with that first group of 11 pupils was to provide them with a rich learning experience in a small group setting. The school year went well - so well that parents asked Pollard to take additional children. By the fall of 1999, her little Blossom Wood Day School had enrolled 36 children, included a first grade and borrowed class space from a church in Spanish Lake. Pollard hired faculty member, developed an early learning center for preschoolers and started summer enrichment programs. By that time, Blossom Wood Day School had developed a philosophy of education: Pollard hoped to provide her students with an academic foundational that was more advanced than what they would receive in a public school. They also would develop a commitment to community involvement and to building good character. While African-Americans make roughly 5percent of the enrollment in similar independent schools nationally all of Blossom Wood’s students are African-American. Pollard attributes that to the way the school developed in the community. She is optimistic that the school’s multicultural focus, emphasis on small-group learning and Christian environment will attract families of all backgrounds. “We want to be a good school, not a good white school or a good black school,” she said. And this year, Blossom Wood’s 75 pupils from preschool to fourth grade will be learning in a building all to themselves. An aggressive fund-raising campaign allowed the school to lease and renovate the former St. Bartholomew Catholic School building at 8390 Latty Road. Lee Ross, a polite fourth-grader, who will be taking pre-algebra this year, is suitably impressed by the school’s evolution and new spacious quarters. “We could fit out (old) school five times in this room, believe it or not,” the 10-year-old said while giving a tour of the school’s new cafeteria. Genie Newport, the head of Independent Schools of St. Louis, said having an independent school in north St. Louis County provides a great option for parents. Tuition at Blossom Wood ranges from $3,600 to 4,000 annually, and parents like Dr. Maxine Stewart donate at least $200 above that each school year. But Stewart says her investment is worthwhile when that money spent produces exciting results like a new school building and a sound education for her daughter, Jnev.